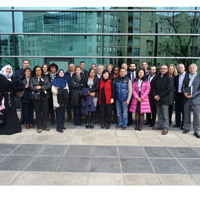 Webster University's Geneva campus celebrated 10 years of collaboration with Grenoble Ecole de Management's DBA program. This year's cohorts again represented a very culturally diverse group of students pursuing a rigorous academic part-time program that includes workshops, intensive online resources and face-to-face mentoring. This year's program began with the 2016 cohort’s first workshop on Nov. 21 at Grenoble Ecole de Management (GEM) in Grenoble, France. Presentations were given by both Fernando Lagrana, director of the DBA collaboration from Webster University, and Pierre-Yves Sanseau, director of the DBA Swiss cohort from Grenoble, as well as other management from GEM. They welcomed students from both the U.S. cohort and Swiss cohort whose citizenships vary from countries including Nigeria, Saudi Arabia, South Korea, China, French, Iceland, Russia, Germany, Mexico and the United States. The DBA Swiss cohort has been the most culturally diverse of all. Applications for the 2017 cohort of the Grenoble DBA are already being accepted, with interviews beginning as early as March 2017. For more information, visit www.webster.ch/dba.